At the end of August we took part in an annual event in the village of Vrsno pri Kobaridu, Slovenia. 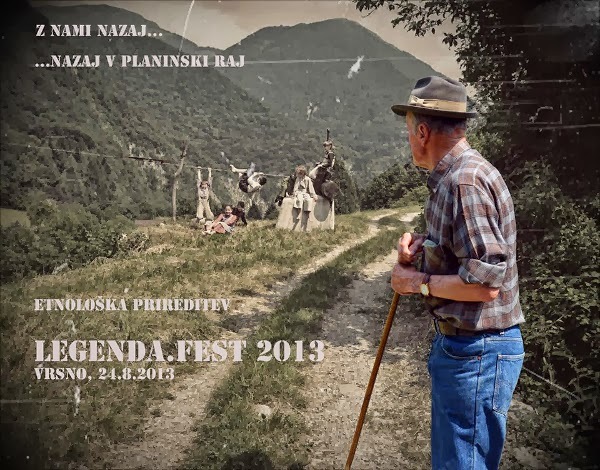 Legenda fest took place only for the second time in a row, but with the enthusiasm the whole little village put into the event, there was much to admire. As it is obvious from the post's title the festival focuses on ethnology and history of the region. Since the local area is still pretty much rural, most of the old crafts and traditions are still alive in one form or another. To make sure those are not forgotten and to revive a few others, the local tourist association has set up this great event. As a birthplace of a famous Slovenian poet Simon Gregorčič, Vrsno has always been a place of culture. Locals have always had a special affection for patriotic, cultural, poetic and similar ideas. This was also reflected through their devotion to this event and their focus on well-being of every visitor. We really felt welcome. It seemed like everyone of the 125 villagers (source: SI-STAT) living there today participated in the event. There was a different workshop set up on every corner. Some focused on traditional local cuisine, others on old local crafts and there were even a few workshops suitable for children. For a visitor coming from an urban area this was a great opportunity to get a taste of a countryside vibe of the times long gone. Everyone participating in the event was dressed up in typical authentic costumes and used authentic, mostly home made tools from the past. A visitor could witness how cheese and other local dishes were prepared in the time before electricity was introduced to the area. There was an opportunity to taste most of those things on the spot. On the above photo is an example of such a simple dish - roasted potatoes with cottage cheese. Everything could be washed down with a generous sample of local schnapps at a small improvised distillery set up near the central village square. One particular yard in front of a random house was almost impossible to pass without making at least a short stop. Smell of freshly roasted coffee was inviting visitors to take a closer look. You guessed it - it was a demonstration of coffee preparation - the good old-fashioned way. Roasting, grinding and cooking were all done using actual equipment used in the time of our great-grandparents. It tasted at least as good as it smelled. A special kind of an attraction was a demonstration of hay delivery to the village with the use of a steel cable. Since a large proportion of hay is dried higher on the mountain slopes, this was an ingenious idea for transporting large quantities of it directly to the village where it was stored and fed to cattle during long white winters. There were also other interesting things on display - like for instance sheep shearing. Also the complete process of wool production was demonstrated. The afternoon was over all too fast. The event was still in full swing when we unfortunately had to hit the road. Hopefully we shall return on another occasion and sample some more of the genuine local hospitality. If you find yourself in the Posočje area at the end of August I can easily recommend a visit of this event. A genuine experience is guaranteed! Wow! I love your photos in this post - the first four literally made me open my mouth and go 'wow'. Very nice. Did you use ColorEfexPro? This is a lovely post too. I love rural festivals like this. I am not familiar with ColorEfexPro but will look into it. I just used some Lightroom presets and additionally tweeked them for every photo. This rural festival was really as genuine as they get. I truly recommend it.